Congratulations and Kudos to the National Association of Independent Schools, its Commission on Accreditation, and its Schools of the Future Committee for their publication this winter of the new A Guide to Becoming a School of the Future. The 60 page document, prepared by Robert Witt and Jean Orvis as lead authors, is an attractive, appealing guide and deserves reading by every independent school board and faculty. The schools are academically demanding. Project-based learning, as an integral part of the school’s program, is woven throughout all grade levels and disciplines. Classrooms extend beyond the school walls, actively engaging students in the world around them. Digital technologies and a global perspective infuse all aspects of the curriculum. Vibrant arts programs help promote creativity, self-expression, self-discipline, and flexibility. The adults are actively engaged with one another and with the students in a process of continuous learning. A culture of engagement and support invites participation, innovation, and a“growth mindset” on the part of teachers and students. Transformational leadership challenges the status quo, draws out the issues, navigates through conflict, and mobilizes people and resources to do the adaptive work necessary to create and sustain effective change. Academically demanding comes first, as it came first in my previous post, 15 Ways for Schools to Be Relevant in 2015 and Beyond. What I worry about as I read the guide’s first bullet is that this wording, “academically demanding,” is a bit generic, and leaves me hanging– well how do you know? I would have written, Schools are academically demanding as demonstrated in widely varying quantitative and qualitative ways. This is the gold standard for academic excellence, that the proof is in the pudding, not the recipe; at St. Gregory we are moving to an expanded report card, implementing digital portfolios, and publishing on-line much more student work at the same time as we are using two new testing tools in very high profile ways, the CWRA and MAP, to demonstrate our commitment to a truly highly academically demanding program. Our 12th grade students last spring median performance was at the 97th percentile of all college freshman– that is proof positive of an academically demanding program. It is exciting to me see Project Based Learning in such a prominent position here– as it should be. High Tech High, New Tech Network schools, and many others which are paving the way as truly futurist schools are doing so with PBL, and I write and enthuse about it often on this blog. At St. Gregory this is a central thrust of the development of our academic program. I might have amended these words just a tad– I might have added the words “often enhanced by digital tools” to the opening PBL phrase, and I might have added something about the importance of PBL being held to the highest standards of rigor in its outcomes. 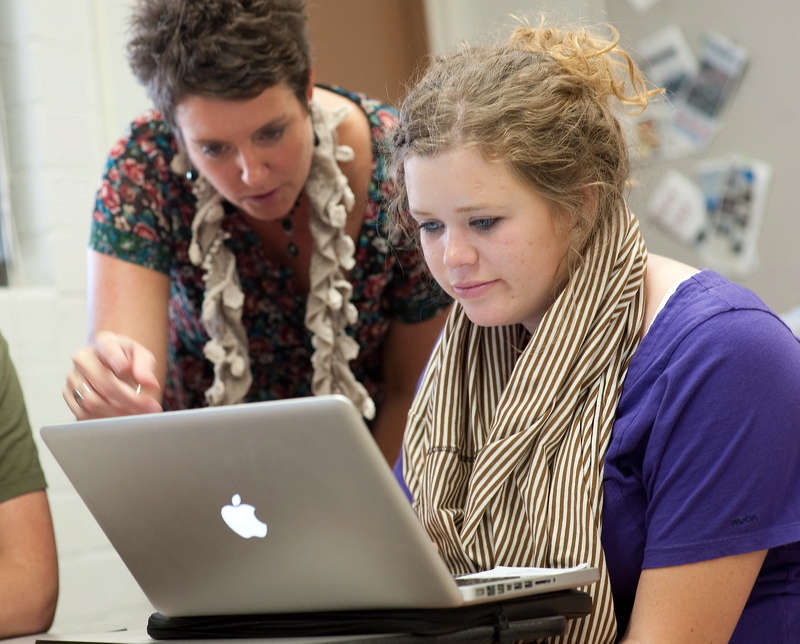 Digital Technologies infuse all aspects of the curriculum. Yes: a 1:1 laptop (or other other mobile digital device) program is absolutely essential to the School of the Future. St. Gregory commenced its 1:1 program this year. A Global Perspective. Terrific to see this here; while it has a place at our school, St. Gregory, most particularly in student trips to France, Italy, and Kenya, it needs to be bolstered and I have been under-attending to it. It is funny to write that at this very moment, however, as I am writing it from San Carlos, Mexico, as I am on a five day trip meeting with schools in this region to develop intercultural exchanges! Adults engage in continuous learning. So great to see this, and I think it may be the single essential prerequisite of a School of the Future. As I wrote in the previous post, For our educators to be teachers in the digital age they should be learners in the digital age. The central value of this element has been one of my major themes in my speaking this year, as at NEIT: Leading in Learning as Lead Learners. At St. Gregory, we have put the emphasis on providing time; from one hour a month to two hours a week dedicated and reserved for faculty learning and collaboration– and let’s be clear, even these 2 hours a week isn’t enough yet. Engagement is at the core of excellence in education: students who aren’t engaged aren’t learning. One of the many ways to take this work seriously is to administer and use the results of the High School Survey of Student Engagement, as we do at St. Gregory. Innovation: How great it is to see this word featured prominently in the new national publication from NAIS about becoming a School of the Future. I would have written it more strongly, of course, more strongly than innovation is “invited,” but at a school which proudly claims to Create Leaders and Innovators this is great to see. “Growth Mindset.” No, not one, psychological concept or “theory of mind” is more influential to my thinking and more important to our work in our fast-changing times than this one, from Stanford Professor Carol Dweck. If we don’t work to battle against the fixed mindset, the product of telling students how smart, successful, or accomplished they are (with the exclusive exception of saying so in a way very narrowly focused on effort), Dweck explains and our NAIS guide here endorses, we risk severely inducing in our students a mindset resistant to learning new things, experimenting, and persevering through challenges. Teachers and students. One of my major themes in my speaking this year is the message that our transformational age requires us all to adopt the growth mindset, and requires us all to develop 21st century skills, and requires us all to be innovative– and requires us all to model this for our students. What is great is that the faster the world changes, the more we become on the same side as our students, working with them as their coach and captain but learning beside them as fellow journeymen on the road to successfully mastering the challenges of our new age. Teachers and students. Transformational Leadership challenging the Status Quo. As school-leaders, it is enormously incumbent upon us to honor tradition and ensure we carry forward essential symbols and signifiers, rites and rituals of our school tradition. This is a message I know I need to remind myself, and welcome others to remind me of, often! But, simply put, leadership for schools of the future requires more than tradition– it requires the willingness to challenge the status quo, ask the tough questions, and be willing to change what isn’t working for learning in our fast-changing world. About asking the tough questions– close readers of the new Guide may find on page 36, Appendix A, my contribution: a series of questions schools can consider using to facilitate these conversations. These are the kinds of conversations we have had in board meetings, at FA meetings, at our Academic Committee meetings, and in our Academic leadership team meetings often. The questions originated, and in this publication have been modified a small amount, in October 2009, when I had the great honor of being invited by Rhonda Durham, Executive Director of ISAS (Independent School Association of the Southwest) to join her and Mark Desjardin, then head of Holland Hall (OK) and now of St. Johns (TX), in presenting and facilitating a conversation with the other ISAS Heads. After several conversations with both Rhonda and Mark, and with particularly helpful influence from Rhonda’s sharing the work of the Schools of the Future Committee, it was my pleasure to draft these questions for our session, and I feel indebted to Rhonda for thereafter sharing them with the SoF team. Here they are again (they were originally posted here on the blog in November, 2009, with some of the answers from the audience to the questions provided also), as revised and presented in the guide booklet. 21st Century Life: How has the world changed and what are the implications for education? 21st Century Skills: Does the NAIS Commission on Accreditation Schools of the Future Committee’s overview of 21st Century Capacities hit the mark? Does a new/renewed emphasis on skills necessitate a decreased emphasis on knowledge learning? 21st Century Students: How are students today the same as their predecessors and how are they different? How do we respond to the differences? 21st Century Instruction: How must it change, and how can we accomplish this? What do advances in brain research and the cognitive sciences teach us about the learning process that we did not know before? What are the implications for the classroom? 21st Century Assessment: Does traditional letter grading continue to be effective as a measurement and an incentive for what we want students to learn, or does 21st century learning require new-format assessments? If so, what assessment techniques are required for 21st century learning? 21st Century Teachers: What are the characteristics of a 21st century teacher? What are the implications for our hiring practices? How do we best facilitate our teachers’ evolution to contemporary teaching and learning? What forms of professional development are called for? 21st Century Curriculum: Does 21stcentury learning demand a renewed attention to inquiry, relevance, and/or project/problem-based learning,or are these alternate approaches too problematic to adopt wide-scale? Can the curriculum balance the teaching of core academics and 21st century skills? If so, how? 21st Century Learning Technology: Does contemporary learning require a large or larger role for laptops and other digital tools in the classroom and what are the pros and cons of wired classrooms? More to come on the blog here about the SoF guide in the forthcoming weeks. Every time I read your blog I like you more. I wish I knew about your interest in Carol Dweck when we were in Philly. I have been obsessed with her for years. I am an absolute believer in the growth mindset and had read her book when I was in high school, I think it might have changed my life (back when I decided I wasn’t good at math). I am not, however, convinced of the necessity for a school to be one-to-one laptops. The students at my school are so connected when they are not in school, I don’t think they need to have a laptop with them every day. We have labs and laptops available for teachers and students to use when they need them. We are a Google Aps school, so much of their work is in the cloud, making it easy to work on multiple devices. I really like the idea that we maximize our face-to-face time in the classroom, and use computers and other mobile devices for homework and when we need them in school. Not to mention, we don’t have lockers and kids throw (literally) their backpacks all over campus all of the time. That makes the logistics of one-to-one very challenging for us. Nice post. I think the unifying themes are great and just what I’d want for my son’s school. In my way of thinking, I’d shift the language somewhat to read as core values, rather than unifying themes. Although I understand if core values are school specific, and unifying themes are simply intended to unite the Independent Schools, no matter where they may be. I don’t know if this is good or bad, but are these themes supposed to be Independent School specific? I’d sign up for these right now, and as you know, I’m not at all affiliated with an independent school. @Liz: Maybe not 1:1 laptop, but, imho, students certainly need in schools of the future 1:1 mobile digital device. But we can happily agree to disagree, and agree to keep learning with an open mind and a growth mindset about what the best strategy is. @Eric: No, the report from NAIS offers unifying themes they observed and drew from a wide array of best practice “schools of the future,” including High Tech High, and so is expressly not limited to independent schools. The authors and I agree that some of the best practices are coming from outside of NAIS, and that the unifying themes can and should apply to all sorts of schools. Can you bring them to your superintendent and school board?